If you are looking for meeting room hire in Sutton or South London, why not hold your meeting in one of our modern air-conditioned rooms, with natural daylight and remote controlled skylight windows. We can provide flip charts, markers, projectors, TV screens and DVD players for your meetings at no extra cost, although you would need to provide your own laptop with VGA connections if the projector is required. Light refreshments (teas and coffees) can also be provided for your meetings at an additional cost. Dimensions: 6.20 x 4.75 metres approx. Our meeting rooms are divided with removable partitions, and can be combined for larger audiences or more space. We can offer either: Meeting Rooms 1 & 2 or Meeting Rooms 2 & 3 combined, subject to availability and current bookings. Dimensions: 6.20 x 9.50 metres approx. All three Meeting Rooms can also be combined to give a light, spacious setting for large board meetings or audiences. Dimensions: 6.20 x 14.25 metres approx. 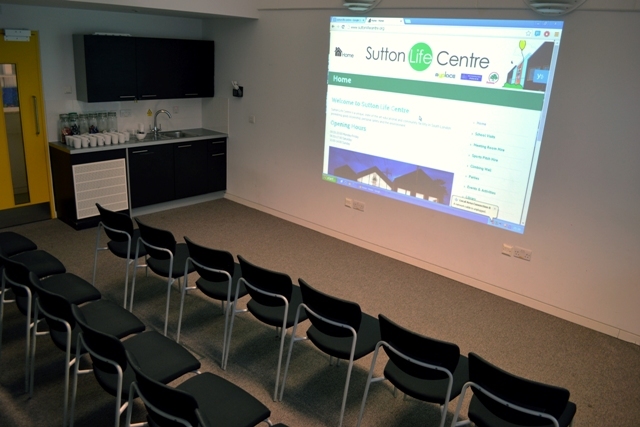 For more information about meeting room hire at Sutton Life Centre, or to book, please contact us – we’ll be happy to help with any enquiries you may have.